1st Gear: What The Hell’s Going On At Apple? Man, yesterday was a weird day. First news broke from the Financial Times that Apple was in talks to buy McLaren. Then, very quickly, McLaren denied talks of an investment or purchase were taking place. We know Apple’s car project—whatever the hell it is now or was supposed to be at the outset—is in trouble. It just got hit with layoffs and a reported complete direction change. The New York Times and other outlets report Apple and McLaren were in “talks” on some level, but hey, companies “talk” all the time. That is entirely possible and it may not lead to anything. 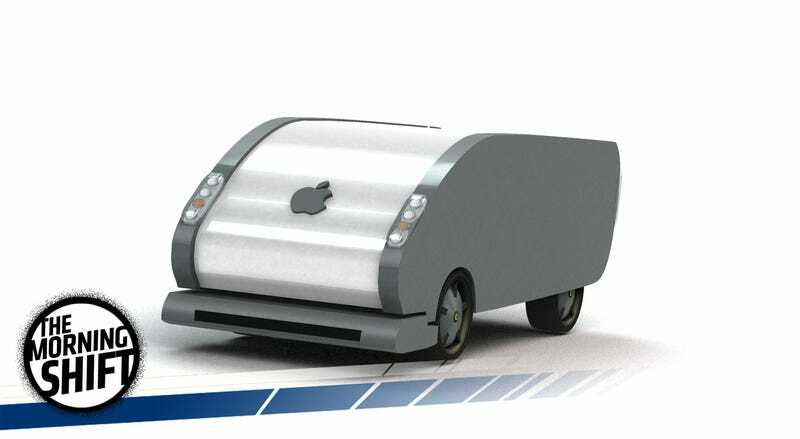 But Apple is almost certainly discussing or eyeing vehicle companies on some level. Apple is also in talks with Lit Motors, a San Francisco start-up that has developed an electric self-balancing motorcycle, about a potential acquisition, according to three people who spoke on the condition of anonymity. Apple has already hired several former Lit Motors engineers. Even as many Silicon Valley companies, including Google, Tesla and Uber, have embarked on electric and driverless car initiatives, Apple has kept quiet. Yet internally, it has pursued a car project, called Project Titan, which has had ups and downs in leadership and direction. The layoffs at the project this month came after the appointment of an Apple veteran, Bob Mansfield, to take over the effort. Inside Apple, employees recently described the company’s efforts to build a car as a project lacking vision and in complete disarray. The recent layoffs, followed by Apple’s pursuit of talent and expertise from outside companies, are part of the company’s effort to “reboot” the project, said people with knowledge of the layoffs. It’s all hard to gauge since we have no clue what Apple wants from a car program, especially now. Nearly on its way out the door, the Obama administration is seeking to establish requirements that would double the average vehicle’s fuel economy by 2025. Unsurprisingly, automakers aren’t happy about this, since demand for fuel efficient and electric cars is so weak right now, and because as Reuters reports, it could cost the industry as much as $200 billion over 13 years. The trade group represents General Motors, Toyota Motor Corp., Volkswagen AG, Fiat Chrysler Automobiles and other major automakers. [...] Automakers have sold 448,837 plug-in hybrid and electric vehicles since 2011, less than half of President Barack Obama’s goal of putting one million such vehicles on the road by 2015, according to the testimony. Obama administration officials countered in their written testimony that the policy is working. National Highway Traffic Safety Administration general counsel Paul Hemmersbaugh and Environmental Protection Agency official Janet McCabe both said that fuel saving technologies are entering the market faster than expected. Volkswagen (VOWG_p.DE) pledged to fix all cars equipped with illicit engine software in Europe by autumn 2017, the European Commission said on Wednesday after talks with the carmaker to ensure it is doing enough for affected clients. At a meeting with consumer Commissioner Vera Jourova, VW board member Francisco Javier Garcia Sanz committed to a plan to inform customers by year’s end of the need for a technical fix to bring diesel cars into line with EU caps on toxic nitrogen oxide (NOx) emissions, Jourova’s spokesman said. VW has admitted that it installed improper software that deactivated pollution controls on more than 11 million diesel vehicles sold worldwide. General Motors will use its Oshawa, Ontario, assembly plant to expand production of pickups for the North American market if a tentative agreement with Canadian auto workers is ratified, sources familiar with Canadian labor negotiations told Reuters. Oshawa’s manufacturing plant, which employs some 2,500 workers, will install component parts and do final assembly of pickups using bodies shipped from a GM plant in Fort Wayne, Ind., the sources said. It was unclear if or when the Oshawa plant will do full production of the pickup, and sources did not know what production volume the assembly represents. GM representatives declined to comment ahead of the union’s ratification vote. That’s good. People buy pickup trucks. They make money. 5th Gear: Can We Move Fast On Self-Driving Cars? This time may be different. The NHTSA’s autonomous-vehicle rules appear to recognize the competitive pace, the transformational import of the technology, the pressure to commercialize it, and the need for government regulators to move more quickly. All of which, for now, is considered generally positive. And they are. A package of bills governing how and where autonomous vehicles could be developed, tested and driven on Michigan roads has cleared the state Senate and a House committee and is expected to be considered by the full House within the next two months. Neutral: What’s Your Take On Apple/McLaren? It’s definitely an interesting report, but also hard to imagine in reality. Will it never happen or is it possible? And would it be better for one party than the other?